I usually dont read Mythological genre book but this with such a strong Female protogonist looks promising. 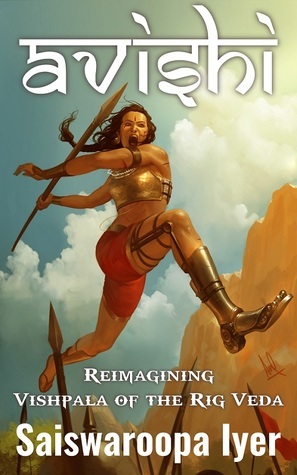 Saiswaroopa Iyer brings to you Avishi, the Warrior Queen with an Iron leg. The structure under the outcast control looked like an autonomous garrison. It was on the Southwestern corner of Vrishabhavati hidden by wild growth and as heavily guarded as the city square. Avishi counted two doors as Vyala carried her inside. From the inside, it did not look as dilapidated as from outside. The guards here were the ‘out-casts’ as the world called them. Unlike the guards of the city, they did not cover themselves with leather torso. Instead they wore loin cloth in various darker shades. Small and big weapons, strings made up of various animal teeth, tusk work and beads made up their ‘jewellery’. To Avishi, it looked atrociously out of proportion. But she also noticed the level of coordination with which the ‘out-casts’ functioned. Like they were trained to fight in an army. “Untie her.” Vyala instructed Manduka, his forehead revealing wrinkles of dilemma. Manduka was happy to comply. Except for a few scars on his shoulder, the man had an enviable physique. But it was his nose that Avishi felt was the pronounced feature of his face. It was as though it was abruptly turned crooked by his right nostril. She could see that the Outcast Lord made no attempt to hide his displeasure about the predicament she presented him. What worried her more was that she found herself incapable of even walking to the closest stone seat and had to limp leaning on Manduka. The wound seemed deeper than she had imagined it. “We don’t kill women.” He began and paused noticing her unimpressed glare. Avishi glared back at him showing no inclination to explain. She saw Vyala sit on the stone seat next to where she sat. “If Khela does not find a proof of your death soon, we would have to incur his wrath! An atrocity against the outcasts would not even be seen as a transgression by anyone.” His lips pursed for a long moment. Avishi wondered if he expected a solution from her. Something she would have to help him out if she had to escape alive. But before she or Vyala could speak, a sound of heavy anklets was heard. Avishi turned to her right and saw a young woman, not older than seventeen autumns scurry and then clutch at her bulging belly. Her arrival only seemed to increase the gloom on the faces of both the men. “Brother Vyala, did he not come with you?” Her shrill voice made Avishi think she was even younger than she looked. And impregnated at this age? “Go back to your room, Majjari.” Vyala hissed. But Majjari was in no mood to heed her brother’s words. She eyed Avishi, her head tilted to left and brows knitting. Her eyes then brightened. Avishi had decided that her patience was at its tail end when she saw Vyala hurry and pull Majjari away, making her wince at his grip. Majjari shook his arm away with a hiss. “Wait till I become the Queen, you, worthless dog!” Her tone broke. “I shall make Khela punish you! I bear his prince! Mind you!” The fierce frown stayed on her forehead long after she countered her brother. Avishi saw Manduka intervene and lead Majjari away with endearments that one would use with a toddler. Future still hung in balance. Avishi had to come to terms with the fact that any attempt to escape from here will only complicate things for her. And she truly needed her wound to be tended. The knife that wounded her might have rusted. Tears of frustration threatened to flow out of her eyes. She told herself to bide her time and regain her lost energy. 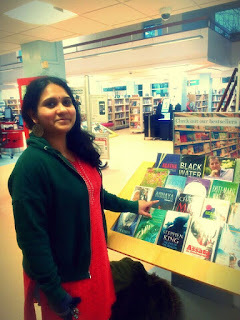 Saiswaroopa Iyer is an IITian and Venture Capital professional turned author. Her debut novel Abhaya, published in 2015, was a tale set in the Mahabharata period, exploring the legend of Narakasura Vadha. She likes to focus and expand on ancient Indian stories with strong female characters.